Maritime history is one of the foundation stones of Hawaiian history. Whether the focus of that remarkable heritage spotlights ancient Hawaiian’s navigating the vast expanses of the Pacific Ocean by the stars, the 19th century whaling industry, ocean liners arriving at Aloha Tower and Boat Days, Hawaii has a unique maritime past –especially pertinent as America’s only state totally surrounded by the ocean. In today’s Honolulu Advertiser comes news of the visit to Hawaiian waters by the square topsail schooner the Lynx, a 122-foot two-masted reproduction of a War of 1812 privateer homeported in Newport Beach, California. 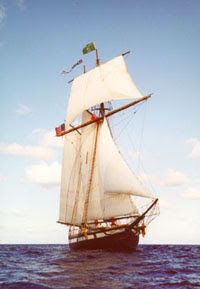 The ship operates as part of the Lynx Education Foundation, a California nonprofit. The Lynx will be at Kewalo Basin through Thursday and at Ko Olina Saturday through Aug. 9. Then it sails for Kaua'i. For more information on the Lynx and its visit to Hawai'i, see www.privateerlynx.org or call 866-446-5969. Click here for the Advertiser’s photo gallery. The capitol city of Kanagawa prefecture in Japan is the city of Yokohama, straddling the south coast of Tokyo Bay. It is Japan's most prominent port and Japan’s second largest city. Yokohama’s place in the history books came in 1853-54 when Commodore Matthew Perry’s American fleet arrived in the waters just south of the city. With the signing of the Treaty of Peace and Amity by Perry and representatives of the Tokugawa Shogunate Yokohama was opened as an international port city on June 2, 1859. This year marks the 150th anniversary of the opening of the city to international commerce and trade. The Massachusetts Institute of Technology (MIT) as part of its Visualizing Cultures initiative published in 2005 an online exhibit in collaboration with the Arthur M. Sackler Gallery at the Smithsonian titled Yokohama Boomtown: Foreigners in Treaty-Port Japan, 1859-1872. This online exhibit features a rich and colorful selection of visual representations of the port city’s early years, especially on the foreigners who made the city their home in a time when modern notions of commerce and westernization were taking root. A large online gallery "Boomtown, the story: the new treaty port", and a gallery 'Sadahide The Observer: Yokohama Harbour' is also featured. A Flash Shockwave presentation displays the 35 steps involved in the making of a woodblock print. There is a full database of images, searchable by keyword, title and medium. Highly recommended for history buffs, classroom students and educators. This interesting business history journal from Oxford, "offers a forum for research on the historical relations between businesses and their larger political, cultural, institutional, social, and economic contexts. The journal aims to be truly international in scope. Studies focused on individual firms and industries and grounded in a broad historical framework are welcome, as are innovative applications of economic or management theories to business and its context. Quantitative work couched in terms accessible to non-cliometricians are also welcome. Enterprise & Society actively encourages submission of studies of business that arise from collateral social scientific and humanities disciplines (for example, historical sociology anthropology, political economy, geography, and theories of economy and societies)." The Friend was originally published in 19th century Hawaii by Rev. Samuel C. Damon, a missionary chaplain with the American Seaman's Friend Society and chaplain of the Seaman's Bethel in Honolulu. The following article, submitted by "S.L.E." was published in the July, 1845 edition of Damon's monthly newspaper. "One reason why young people so often think study a hardship and education irksome arises from the manner in which their studies are conducted. "A certain portion of geography, of history, of languages, and various other subjects is read or committed to memory, without any connection between them being maintained. With regard to history, for instance, a history of Greece or of Rome, or of England is put into the hands of young persons, and when they have gone through its pages, containing a record of certain events that transpire at certain periods, and of certain characters instrumental in producing those events; and if the pupil can remember in what particular period any great battle was fought, or at what time such a king reigned, or such a republic flourished they are considered to be acquainted with history. They know, however, no more of the moral characteristics of the several nations which have passed under review, or their local peculiarities, of their progressive improvements, of the influential bearing which one country has upon another than they know of the conformation of their own minds, and think no more of the cause and design of the complicated, yet wise arrangement of the earth's affairs, than they think of the volitions which bring their own muscles into play, their limbs into action. "But let history be viewed, not as a mere chronological register of certain facts and occurrences, a mere record of battles lost or won, but as a science enriched with treasures from almost every source, as a connecting link between the various subjects of contemplation which ought to occupy the thoughts of intelligent beings, and it will at once become a most interesting study. "The history of every nation comprehends, necessarily, its progress from barbarism to civilization; its internal changes, the causes producing those changes, and the various characters by which they are promoted; the rise and advancement of its language, literature, laws, arts, and sciences; the mechanism of its legislative, political and ecclesiastical system, together with the recognition and tracing out of that overruling power whose wisdom guides and controls all the affairs of the kingdom of the world. Hence, if it be true that national character is influenced, in some degree at least, by the climate, natural history, and geography become necessary, and voyages and travels useful auxiliaries to the student of history. "Biography is one of the most interesting and instructive branches, for what are the lives of public men, but the history of the times in which they flourished, the histories of the respective national transactions in which they bore a part? Intellectual and moral philosophy, which appears to me to be the history of the formation of character, is an admirable preparation for rightly studying biography and history which furnish us the the practical development of character in conduct. If it be also true that the history of a nation will depend much on its institutions, whether legislative, civil or ecclesiastical then its laws, its politics, its church history, and all its moral and religious influences should be examined. If, too, the nation derive any of its glory from mind and mind's achievements, then let its literature, its learned men, its arts, and its artists, its sciences and its philosophy share the attention they deserve. Blot from England's annals the names of Milton, Shakespeare, Bacon, and Newton, and the glory will be departed from the times they walked the earth. "History, therefore, so far from being an uninteresting study, although the term be simple, and the general manner of attending to it be almost as unmeaning as the unconnected lenses of a telescope appear to a superficial observer will yet when viewed in all its branches and relations, present to the mind objects of great and universal interest." Commodore Matthew Perry (1794-1858) is the 19th century American who is credited with opening Japan to the West. Many people do not know that he served in the War of 1812, the Second Barbary War, on patrols off Liberia, the suppression of the slave trade in the West Indies and so on. He was also broke new ground as one of America’s first advocates for steamships. There is a Hawaii connection to the opening of Japan by Commodore Perry, mostly documented in local news reports of the time. The Boston Post was quoted in the May 1853 edition of The Friend, citing the comments of an unnamed gentleman just returned from a trip to China. People were keeping a strict lookout all over the Japanese coast with “fires burning in the mountains at night” in case the squadron was to appear under the shadow of darkness. A story from southern China from the November 1853 edition, and dated August 10, reported that the “steamers Susquehana and Mississippi have returned from Japan.” These two steamer ships with the Plymouth and Saratoga in tow “entered the bay of Jeddo in July last and were boarded by the Mandarins. An attempts was made to surround them as usual with boats which the Commodore successfully resisted.” Reportedly the “Commodore went ashore and entertained by the authorities sumptuously. He dispatched the President’s message to the Emperor, with the request for him to weigh well the matters therein contained, take time to consider well his answer, for which he would again call in the spring, hoping that it might be favorable.” At that point Perry returned to Hong Kong, then under British rule. It was an accepted practice in those days for newspapers to quote each other, and The Friend featured an article in its May 6, 1854 edition announcing the signing of the Treaty of Kanagawa from another Honolulu news source, ‘The Polynesian.’ “The Japanese finally met Commodore Perry not as an enemy, but friend.” The article mentions that a primary influence on Japan’s decision was the presence of whaling ships, according to one of the officers of the Saratoga. The article announced that trade would be opened in March 1855, one year after the signing on March 28, 1854 according to published reports. There are a number of learning resources and online exhibits about Perry, the ‘Japan Expedition’ he commanded, the Treaty of Kanagawa of 1854 and its effects. All are ideal for classroom use and for history-buffs alike. This link provides visitors with a good introductory history of Perry’s expedition to Japan, complete with a couple of scanned woodcut illustrations and citation of sources. One of the United Kingdom’s finest museums is the Fitzwilliam Museum at the University of Cambridge. The Fitzwilliam featured an exhibit at the Glaisher Gallery April 1-July 5, 2009. It turns out that Commodore Perry was an avid coin collector. If you missed it you are not to be disappointed, for an online exhibit is available. The Massachusetts Institute of Technology (MIT) since 2004 has published ‘Visualizing Cultures: Black Ships and Samurai: Commodore Perry and the Opening of Japan 1853-1854,’ an online exhibition as part of the Institute's Visualising Cultures initiative. The exhibition focuses on the visual representations of "a pivotal moment in the modern encounter between 'East' and 'West'" and on the people involved. U.S.-Japan Treaty of Kanagawa of 1854 ended Japan’s virtual isolation from the outside world. The text of the treaty is reproduced here. If you would like to see a scanned copy of the original English language-version of the treaty you’ll find it in Featured Documents from the National Archives and Records Administration. Commodore Perry’s grave is in Newport, Rhode Island. In 1917 the Imperial Japanese Mission to the United States paid tribute by placing a memorial wreath on his grave. Labels: 1854, America, Black Ships, China, Commodore Perry, Emperor, Hawaii, Japan, Kanagawa, MIT, Perry's Expedition, Saratoga, steamships, Susquehana, U.S. This is the online version of an exhibit held at the Beinecke Rare Book and Manuscript Library at Yale University. The original exhibit was held October 18-December 20, 1996. The online exhibition has two major thematic divisions: American Nineteenth-Century representations of China and Japan, and Twentieth-Century writers' interpretations of those influences. Just days ago with much aloha and fanfare the Emperor and Empress of Japan visited Hawaii after their recent trip to Canada. We're reminded of the long, shared history between Japan and America. Part of that history centers around the 19th century whaling industry and a man named Manjiro who journeyed to the Hawaiian Islands and the United States, then back to Japan. 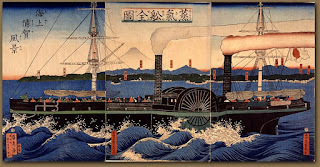 The New Bedford Whaling Museum in Massachusetts has a superb online historical exhibit entitled Pacific Encounters: Yankee Whalers, Manjiro and the Opening of Japan. It is available in both English and Japanese language (no audio). We highly recommend this exhibit for use in the classroom. 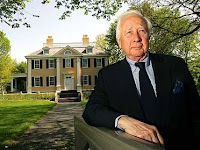 Historian David McCullough discusses the value of an education. How many of you knew that the oldest written constitution in the world is the Constitution of the Commonwealth of Massachusetts, written by John Adams? Learn more. Brigham Young University published this Winter 2006 interview with Historian David McCullough on the importance of citizenship and leadership. Mr. McCullough is on the Board of Trustees of the National Council for History Education. This YouTube clip posted on the Elon University news channel features brief comments about putting current challenges into historical perspective. NASA has posted this link to its celebration of the Apollo 11 Mission 40 years ago. One of humanity's greatest achievements -landing human beings on the moon and returning them safely to Earth- is celebrated today. YouTube features a number of clips we'd like to share here. This channel from ReelNASA features quite a selection of historical images of manned spaceflight, including the lunar landing. 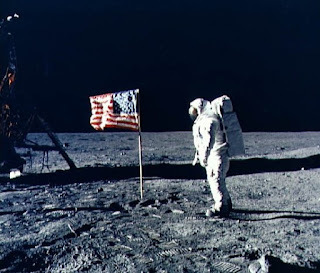 ABC News has posted this clip of Neil Armstrong's memories of the lunar landing. This clip features high-resolution images of Apollo 11 on the Sea of Tranquility from SpaceRip. This clip features President Kennedy's speech challenging the country to send a men to the moon and returning them safely. This also includes Armstrong's first words and the planting of the American flag on the lunar surface. This is the full-length color version of his speech at Rice University. Word has reached us that Dr. Dave Wang of St. Johns University in New York had a paper, Benjamin Franklin, George Washington, Thomas Jefferson and Chinese Civilization published in the online publication of the 2009 issue of the Virginia Review of Asian Studies. Go to this link to read his work. According to Dr. Wang, the U.S. founding fathers with a great vision for this nation worked hard to draw positive elements from Chinese civilization during the formative age of the United States. Benjamin Franklin, George Washington and Thomas Jefferson made their efforts to use the positive elements from Chinese civilization to build a new nation in North America. Benjamin Franklin promoted Confucian moral philosophy to North America in his effort to enhance his own and others’ virtue in North America. George Washington tried to grow Chinese flowers in his garden. 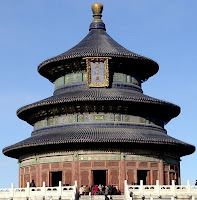 Thomas Jefferson attempted to combine Chinese architectural style with the European style. The founding fathers’ efforts have produced great influence on the United States and become a valuable legacy. VRAS (Virginia Review of Asian Studies) is the official journal of the Virginia Consortium for Asian Studies. As you probably know that VRAS is indexed in the annual bibliography of the Association for Asian Studies and www.asia-studies.com. It has always seemed to me very creditable to the brains of children that they habitually rebel against the study of History, as presented to them. Why should any boy or girl sincerely wish to know in which Olympiad the victory of Corcebus took place, or whether Ottoman was or was not the son of Ortogrul. When the witty Madame du Chatelet owned to Voltaire her profound indifference as to this last point, he did not reprove her, but rather praised her. He told her that she was quite right in her indifference, but that if History could only be taught as it should be –with the really unimportant names and dates left out, and those only retained which really throw light on manners or great events, History would then become for her the most interesting of all studies. Then, when Voltaire himself wrote History, he carried out his own theories, and laid the foundation of the modern school. There still remain among us many institutions where historic teaching means only a list of names, or a complex chart, or “River of Time.” A graduate of a Boston grammar school once told me that she was required in her school days to put on paper every date that occurred in the portion of ‘Worcester’s History’ studied by the class. On a large sheet she made five columns of these dates; she then learned them by heart so thoroughly that she could repeat them backwards, and at the age to twenty-two she had forgotten every one. Warned by experience, when she herself became a teacher, she adopted a wholly different plan. Taking the successive periods, she gave her pupils in each case a few outlines and a few dates from the manual. Then she gave a few questions, of which they were to learn the answers for themselves in such books as they could find in the school library or elsewhere. They were to bring to her all the light they could obtain; she was to add whatever she had. From time to time, wider examinations summed up the whole. This method often led to prolonged study of particular points. Thus, the Reformation occupied one paragraph in the manual they used; but to that one paragraph her class devoted six lessons. The pupils eagerly discussed every point of the reformation –talking it over, Protestants and Catholics together, with perfect freedom- and at the end of the time they passed a written examination that amazed her. Nor did the benefit end here. Her pupils found their love of books rapidly develop, when the charm of a special investigation was offered to them; and one young girl told her, several years later, that her whole intellectual activity dated from this course of lessons; and that whereas she had before been content with an exclusive diet of Mrs. Southworth, she had ever since demanded better food. I am aware that I am suggesting nothing new to the teachers of experience. I am aware also of the obstacles to any course that demands original research on the part of pupils. But, after all, it is only this flavor of original research, on however small a scale, that makes History take any real root in the mind; and a single period or event, explored in this way, fixes the very facts more vividly in the mind than if they had been learned by the heart from a neat little compendium table, all conveniently arranged beforehand by somebody else. Of course History can no more be learned without names and dates than a body can exist without a skeleton. But the driest anatomist does not seriously maintain that the skeleton is the body, and that flesh and blood have no business to exist. Yet the anatomical teacher of History does believe this, and grows indignant when you ask that his department should consist of anything but bones. For myself, I believe in the bones –in their place. No pupils should be permitted to take merely the picturesque and romantic part of any period, without a perfectly connected framework of dates for its vertebral skeleton. But a very few dates will answer for this, and the fewer they are the more likely they will be to remain in the mind. It is better to learn only twenty of these, and to carry them through life, then to be able to repeat five columns backwards, when you are sixteen, and to have forgotten them all when you are twenty-two. If the principle applies to young people at school, it applies still more to those who, having left school, are reading by themselves or with a teacher. There is no young person, I believe, who could advantageously read through Gibbon’s Rome, consequently, or even Bancroft’s United States. But let the student take some very simple outline of the facts and proceed to throw light on it for himself and it will soon prove interesting. How dry is Worcester’s brief narrative of the settlement of Massachusetts for instance! But read it with the journals of the colonists ans given in Young’s ‘Chronicles of the Pilgrims,’ and ‘Chronicles of Massachusetts’ –and throw upon these the sidelights obtained through poetry and fiction, through Whittier’s ‘Margaret Smith’s Journal,’ Mrs. Child’s ‘Hobomok,’ Longfellow’s ‘Miles Standish,’ Hawthrone’s ‘Scarlet Letter,’ and Motley’s ‘Merry Mount.’ When you have ended, the whole period has become a picture in your mind; and the most thoughtful and serious discussion of it, by Bancroft or Palfrey, finds you with a prepared and intelligent mind, if you have the time to give it. And if period after period could be followed up in the same spirit, history would become for you a study of absorbing interest, and in exhaustible in its themes. It may be said that some of these books are “light reading.” They are light reading in the very best sense if they throw light on what else would be dark. I don’t believe in the theory that only what is disagreeable is healthy; but hold that labor itself is most useful when it is applied with a will, and not against one’s will. There is no danger of any one’s acquiring any great range of historic knowledge without corresponding toil; but it is possible so to lay the foundations of knowledge that later toil shall be a delight, and the habit of study its own exceeding great reward.